BBAW begins today! Thanks to Amy, the panelists, judges and the voters! 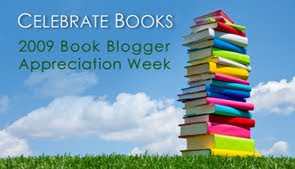 I especially want to thank the book blog readers. Where would we be without you? Probably talking to ourselves.... with or without the 100 cats. Today I want to highlight a few book blogs who might not be on the shortlist but are hella good anyway. If you do something and do it well, then stand and be proud! A Few Minutes with Michael: Michael is a newer book blogger. I enjoy his thorough book reviews. A Book Mine Set: John is the instigator... I mean host of The Canadian Books Challenge, The Great Wednesday Compare, and Saturday Word Play. Amy Reads Good Books: Amy is a new to me blogger. I really like the look of her blog and her writing too. The Book Lady's Blog: Rebecca's adventures in book selling crack me up! Bookfool: She's missing out on a lot of BBAW this week because her son is swimming like the fishes but I think she needs a shout out. Anyway there are tons more but this is supposed to be a short list. Brevity is not my strong suit but I'm going to wrap it up at 5. Oh. I didn't keep mine short at all. Despite the term "shortlist". Thanks for sharing these great blogs -- off to look at them now! Great list! I read a few of these but will have to check the others out. Fantastic list, I'll be checking out those I don't already read. Great list, Chris, and thanks for the love! Woohoo! Lots of new-to-me blogs on this list I need to check out. Thanks, Chris! It was so hard to come up with a list, but you did a great job! You've given me one new blog to check out. Thanks so much for including me on your list! Can't wait to check out some of the others! I'm honoured to be included here too, thanks! Bookfool was sadly missing from that chatty category (which you had my vote for, by the way). Great list of "hella good."